If I get up, put on a nice outfit I feel good in and paint the barn (put on my makeup), I feel prepared to start the day. This way I’m also ready if someone comes to the door. I don’t need to feel embarrassed if a friend stops by and I’m wearing the same thing I slept in. 2. It makes me more productive. I get more done when I am put together. When I wear lounge clothes, I feel tired and just want to sit around. You need to get up and do whatever makes YOU feel productive. Maybe you don’t get dressed up and put on make-up. Maybe for you it’s taking a shower and that’s how you set the tone for the day. But for me, getting dressed and ready tells me it’s time to be productive. 3. I feel like my family should get my best. 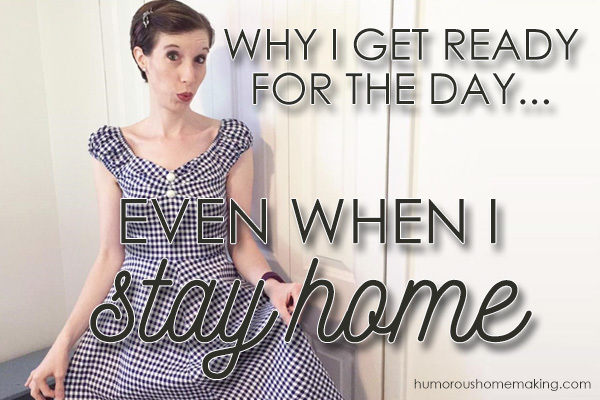 If I am home all day with my family and never make an effort, how are they going to feel when I get all dressed and made-up whenever we have to go to an event, grocery store, or orthodontist? That tells my family that the people outside are more important than they are. When I was trying to get Barry to marry me, I used to get dressed up to the hilt, wearing my very best stuff and always smelling pretty. I don’t want to act like now that he’s got me (or I should say I got him because I totally married up) – I don’t want to say I don’t care how I look now! I want Barry to know that I care just as much about how he sees me now as I did when we were dating. My family deserves my best. 4. I want to make a good impression! Yes, we should be most focused on what the Lord thinks of us…but we don’t want strangers, neighbors, and friends to think that motherhood and homemaking is so hard, it’s killing us. I don’t want to look like death warmed over in my 3 day old pajamas. Do you? Y’all know that live video is my jam. I do live video all over the web from Facebook and Periscope to Instagram. And I also do classes for my oil teams. I get asked a lot… Do you only get ready, all dressed up with your makeup on, because you do live videos? The answer is no. If you were going to see me on a day when I was at home without any plans, would I still be ready? YES! 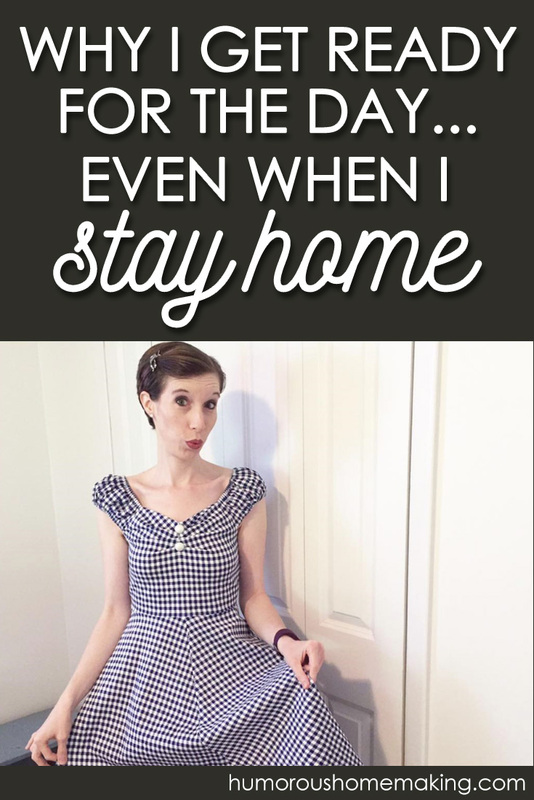 I also get asked, why do you wear your best clothes at home? This is something I’ve had to get over with EVERYTHING – from dishes and towels to clothes and makeup. I was holding on to my best things, for some special day that might come. One day I just realized, if I keep everything for special occasions, then I may not ever get to wear or use it. I asked myself, What am I waiting for?! I want to treat every single day like it is awesome and special. If we eat on my favorite dishes every day, that means I am able to enjoy them every day! If they break, oh well, then I’ll have to find a replacement. But at least I’m able to enjoy them! I’ve seen too many family members die with clothes hanging in their closet with the tags still on, waiting for the perfect special occasion that never came. I don’t want to live that way. I want the things I own to be worn and enjoyed. Now, that doesn’t mean I wear an evening gown to clean the toilet. I save that for fancy occasions with Barry. But for the rest of my cute shirts, accessories, dresses, and skirts – I wear my favorite pieces today and every day. And one more thing, always remember… no matter how much makeup you put on your body, if you’re ugly inside, it’s going to pour out your pores! I know some people don’t agree with my approach, but it’s what works for me. How about you? Do you get ready each day? I so agree with you but I don’t always do it. My husband is gone at work half the week (he works a 72 hour shift) so on those days sometimes I slack off. But when I am feeling lazy, if I put on an apron, even if I’m in my sweats, I suddenly get motivated. It’s so weird. My inner homemaker comes out. What you wear does really make a difference in how you feel! What a hard schedule! It really is amazing how something as simple as putting on an apron (or in getting dressed and putting on make-up!) can transform our whole attitude. Thanks for the comment, Katy! YES! Perfect reasons. I need to do better about this. I love working in my yard helping my hubby. I love tending to my garden. My herb beds, my veggie gardens and my flowers bring joy to me. I love a manicured yard. I love looking nice but when I’m out there sweating I don’t want to wear nice clothes and ruin them. I wear my grundgies. “I want to treat everyday like it is awesome and special”is my favorite part of your post. It is a great lesson for all of us when daily life is a routine. Yes! Agree with this 100%. Thank you so much. The.best.blog post I have read for a LONG time.